The obvious exteriority of skin diseases is one of the reasons why it drew medical attention early in history. For instance, some writings dealing with skin lesion are dated 5000 BC, and the first pathologic classifications were drafted during the Roman Empire. By the way, it is know that Romans and Greeks would use a mix of pumice, incense, myrrh and tree resin to lighten the skin, remove freckles, and smooth wrinkles. Also, Egyptian civilisation is worth mentioning in the field of early dermatology, especially because of its huge contribution including some innovations still used in the modern era. As of 1500 BC, Egyptian doctors tested sandpaper to treat scars, which will become, in the 20th century, a common technique used in skin rejuvenation processes. Maybe more insightful is the fact that these doctors promoted the virtues of solar light, whereas current dermatology experiences an increased use of lasers and phototherapies. As for cosmetics, animal oils, salt, alabaster, and sour milk were in vogue at the time, and the latter was, allegedly, Cleopatra’s favourite product to fill her bath. Lastly, we need to specify that Egyptian dermatology was far from perfect, as the ironic use of carcinogenic arsenic to treat skin cancers shows it. Furthermore, understanding that cutaneous diseases should not be limited to an unique health issue is not a modern view. In the chapter XXVI of Natural history, Pliny the Elder tells about a disease disfiguring the face of its sufferers in Rome. Although it was neither painful nor deadly, affected individuals were in such a state of ugliness that it led to social exclusion and, sometimes, suicidal thoughts. This is part of the first transversal analysis of the consequences generated by a disease through the awareness of social, aesthetic and psychological aspects included in pathological suffering. In this regard, epidermal disorders often aroused the curiosity of non-medical disciplines through the interest of poets, historians, lexicographers or encyclopedists. However, medical views in Antiquity, of which the influence lasted until the 19th century, do not consider skin as a significant element to take into account when dealing with skin diseases, even when cutaneous lesions are the most striking symptoms. Indeed, Hippocrates theory, according to which health depends on the balance of the bodily humours (blood, phlegm, yellow bile, black bile), relegated the skin to secondary roles in every disease. For Hippocrates, skin lesions are only a reflection of an internal illness, or perhaps a sign of good health. For example, the chapter V of Epidemics tells the story of a dermatosis sufferer seeking treatment in a thermal spa, which leads to his death due to dropsy, but also to the disappearance of the dermatosis. According to Hippocrates, the unfortunate treatment of the skin disease was a fatal mistake. Greek and Roman etymologies for the word "skin" is, in this regard, very insightful. The Greek word "Dérma" means "animal hide" or "bare", whereas "dermo" refers to vegetables skin. Also, the term "rhinós", referring to the skin by metaphor, can be translated into the "the leather cover of shields". The same process is true for "teuchos", which has two possible translations : "urn" or "container". As for Latin, the words "pellis", "cutis" et "corium" are historically linked to skin, and they all have in common the notion of container, coverage and protection. Thus, the skin is never enough alone, since it is always supposed to hide something else. Besides, when it comes to give a name to pathologies, it has to be reminded that numerous Latin physicians (Celsus, Cassius Felix, Caelius Aurelianus, Scribonius Largus) have, little by little, added Greek termes (from Galen and Hippocrates) to improve their own descriptions. From this evolution, it resulted some attempted definitions, however quite few, unclear and insufficiently detailed to identify diseases with certainty. The ambiguity of the terms that now describe "leprosy", "scabies" or "herpes" proves it. In other words, the semantic field from which is originated the word skin, but also the lack of accuracy in the first dermatological studies, indicate how superficial it was regarded. For ancient physicians, it was only an external surface of little use, without interest for the study of human body. Until the Renaissance, external parts of the body were, most of the time, seen as a consequence of internal ones. This idea was put into practice in the 13th and 14th centuries, in which the first public dissection with a view to teaching emerged. Indeed, each time the first incisions were made, the skin was immediately put aside in order to start focusing on internal organs, muscles and flesh. We should also quote the title of the first book entirely dedicated to skin diseases : De morbis cutaneis et omnibus corporis humani excrementis (written by Girolamo Mercuriali in 1572), defining the skin only as a way to eliminate the most important internal elements involved in a pathology. Thanks to the work of Andreas van Wesel, a flamish doctor who revealed significant anatomic facts in his book De humanis corporis fabrica (1563, the medical profession began giving importance to epidermis. Distancing himself from the concepts used by his teachers, Van Wesel analyses the skin through its layers and its substance, dwelling on the intermediary role it plays between flesh and nerves. These observations strongly challenged the scientific authority wielded so far by ancient scholars like Aristotle and Galen. While the former regarded the skin as a layer deprived of sensitivity, the latter never noticed the subcutaneous layer of fat. Then, this breakthrough served as prerequisite to conduct dermatological research in the following centuries. However, it was not until the 18th century that the monopoly on cutaneous diseases, held by generalists and surgeons, ended. Not only is it explained by the persistent influence of Hippocratic and Galenic ways of thinking, but also because skin complexity was really understood after the work of Malpighi (1628-1694), who used the microscope in his studies shortly after its invention. Another fundamental shift is the growing desire to classify diseases with rigour, especially from a clinical approach. Jacob Joseph Plenck developed a "doctrina of cutaneous diseases" in 1776, based on the analysis of symptoms, and the foundation of current clinical dermatology is credited to two British doctors : Robert Willan and Thomas Bateman. Thus, the word "willanism" became a definition to describe the fact of diagnosing and classifying diseases after the identification of basic lesions. On cutaneous disease illustrates this classification including morphology. Such a method enabled essential advancements in the description of misknown diseases, like herpes, eczema, leprosis, lichen...Nevertheless, the attention drawn to the improvement of dermatology’s scientificness resulted in a neglection of other possible aspects in the analysis of pathologies, like contextualisation and global studies of patients’ lifes. Jean-Louis Alibert, an hospital doctor used to long patient monitoring, published in 1806 Description des maladies de la peau observées à l’Hôpital Saint-Louis et exposition des meilleures méthodes suivies pour leur traitement, a work in which he put the emphasis on practical medicine centered on patient observation and sensory perception of diseases. For Alibert, understanding a disease cannot be reduced to, far from it, observing basic visible signs. Information on patient life and health, the duration and the cause of the illness, treatment response, are, amongst others, examples of factors to take into consideration in the comprehension of any disease. This ambition was unfortunately too high for the time since little knowledge was built about skin diseases in the beginning of the 18th century, and Alibert’s approach was regarded as utopian, even worst, as useless. The same criticism was expressed against two Alibert’s followers, Hardy and Bazin, who tried to establish a tridimensional and very complex classification of pathologies. Nevertheless, these attempts have at least had the merit to foster a deeper understanding of diseases, going beyond mere description. 19th and 20th centuries have witnessed the emergence of essential scientific disciplines involved in the care of most diseases. Immunology, microbiology and genetics brought about substantial advances which were, during their birth, overestimated in so far as they were expected to enable a full knowledge of all existing diseases as well as the conception of revolutionary treatments. Eventually, major steps forward occurred, but, in the case of many diseases, researchers still cannot boast of a total understanding, which unceasingly raises new questions to answer. As a result of these many progresses, impressive from a therapeutical point of view but lukewarm in terms of disease understanding, researchers considered unnecessary to classify pathologies according to specific criteria. Some publications became elaborated in a more personalized (or less ambitious) way. Norman Purvis Walker, a famous scottish dermatologist, released in 1905 Introduction to Dermatology, which is structured as a selection of descriptions including photographies and schemes. Also, a recent manual written under the direction Louis Dubertret, Thérapeutique dermatologique, is made up of chapters arranged in alphabetical order, either for diseases, either for treatments. Obviously, institution and research developments were the main drivers in the evolution of modern medical specialties. 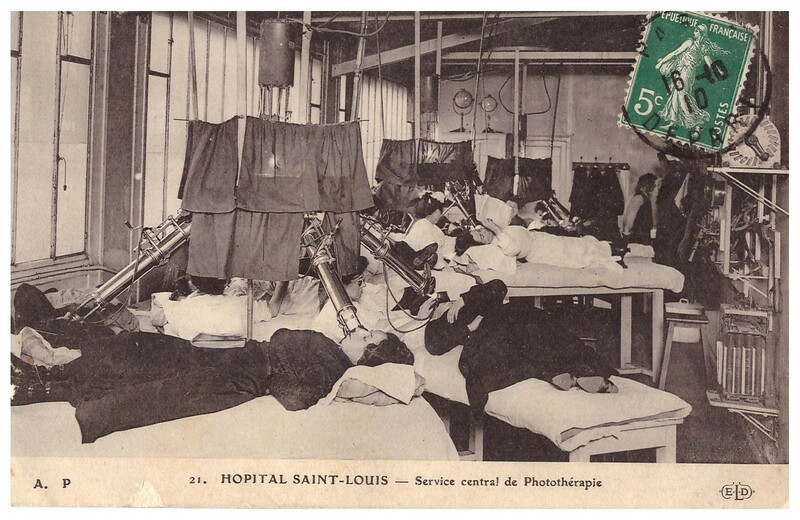 The key role played by Saint-Louis hospital in the 19th century exemplifies the strength of institutions having centralized the successful sophistication of medical specialties. In 1801, an order from the "Conseil général des hospices", adapts Saint-Louis hospital as a place dedicated to dermatological care. Besides, it became the home of the first dermatological school under the influence of Jean-Louis Alibert. Other significant events in the establishment history were the implementation of a clinical chair for cutaneous and luetic diseases, and, that of the "French Society of dermatology", respectively in 1879 and 1889. Beyond the rise of new technologies which continuously involve the creation of different treatments, the changes initiated by dermatology were common with many other medical specialties : having a patient-centered approach, adapting to interdisciplinarity and public health issues, and developing research. Today’s dermatology, except research and scientific improvement, has a lot in common with ancient times. The interest in social, aesthetic and public challenges raised by a skin disease is noticeable in Antiquity and Middle Ages. Cosmetics is an other good illustration of this historical continuity : Galen deemed complexion and anatomic proportions, reflecting the balance of humours, as relevant indicators to assess the health. Also, the study of Byzantine medicine provided evidence for the value given to physical appearance, notably through the frequent practice of removing freckles, wrinkles and hairs. Records on Late Antiquity and Middle Ages testify the stories of physicians, many of whom being women (the case of Trota of Salerno remains today a symbolic example), who experimented remedies in contexts of social, sexual or ideological emancipation. Interestingly, these issues are the same that today’s medicine, in particular dermatology, has to deal with.